In 2008 the Nobel Prize in Chemistry was awarded to Osamu Shimomura, Marty Chalfie and Roger Tsien "for the discovery and development of the green fluorescent protein ï¿½ GFP." 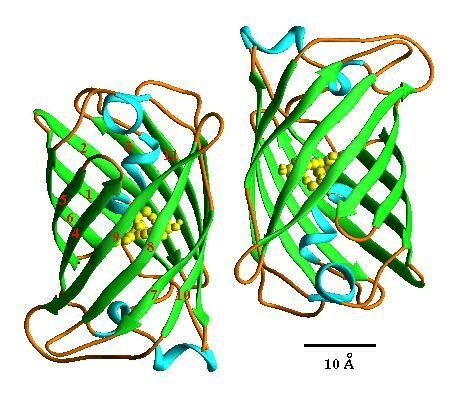 Green fluorescent protein glows green when exposed to blue or ultraviolet light. Some history. In 1962 Shimomura reported on luminescent proteins that he extracted and purified. The GFP had been extracted from Aequorea victoria, a "luminous hydromedusan." 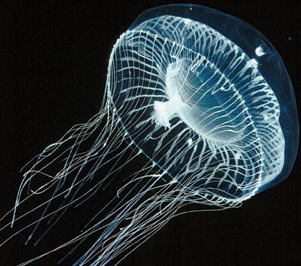 In other words ï¿½ a jellyfish that produced green light!! Since then a number of different mutants of this gene have been engineered by R. Tsien with improved characteristics for laboratory and research purposes. So, now the scientific community has access to blue, cyan, yellow and red glowing proteins. 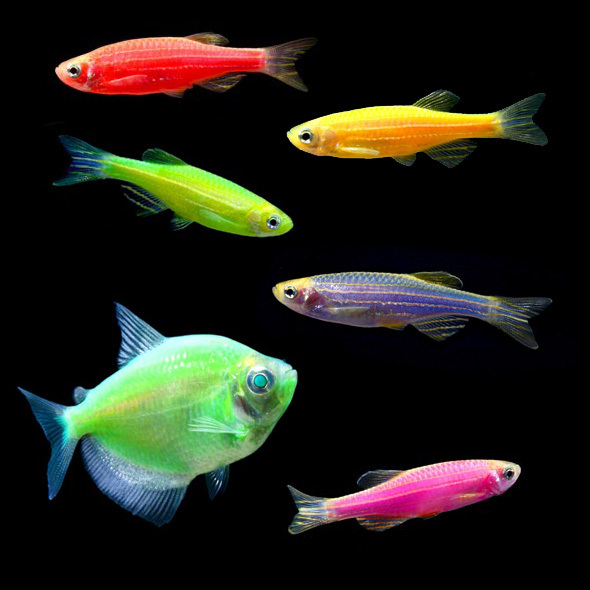 On the novelty level, the genes for producing these different fluorescent proteins have been introduced into zebra fish which are now marketed (but not in California) as GloFish. Other fluorescent pets carrying the same or similar genes include a green fluorescent rabbit, NeonMice which are fluorescent green, Noels (green fluorescent pigs) and green fluorescent cats. Now, what, you may ask, has this got to do with geraniums (Pelargonium)? You will remember from last monthï¿½s newsletter, that the genetically modified Pelargonium had five genes introduced by the bacterium Agrobacterium tumefaciens. Only two of these genes were important in modifying the Pelargonium plants for commercial purposes (delayed senescence or long-life and male sterility). The other three genes were there for scientific research purposes. One of these genes was labelled ï¿½ gfp ï¿½ the green fluorescent protein gene. But on a serious scientific level, how are these genes for fluorescent protein used? When these proteins are present, under the influence of blue or ultraviolet light, they produce visible green (or other colored) light. 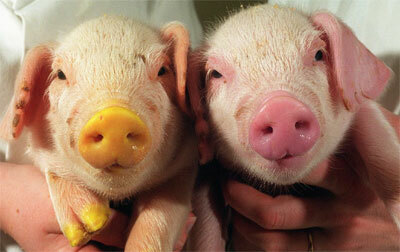 This allows the presence of these genes (which are submicroscopic) to be seen by the light they produce. In practice, investigators are not interested in the green fluorescent proteins themselves, but rather they are used as markers or tracers when attached to other invisible genes whose presence and function are being followed. So, in the case of the male sterility gene in Pelargonium, the trait can only be seen when the plant blooms. In real time, blooming occurs many months after a cell has been transformed and grown up to a full sized plant. However, if the male sterility gene and the gfp gene are carried together, then using a fluorescence microscope, you can see the green light of the green fluorescent protein long before an actual plant is produced. In conjunction with time lapse photography, one can see the dynamics of cell/tissue/organ development. Now you can see how this gene from a jelly fish can be used to analyze various processes in addition to detecting the presence of linked genes in plants. These include studies of brain circuitry, neuron membrane potential, viral entry into cells, etc. According to C.N. Stewart, Jr. et al (2002, Ch. 19) the gfp gene has been used as a transformation marker in soybeans, sugar cane, barley, rice, oats, oranges, tobacco, wheat, apples, various members of the mustard family and now Pelargonium. 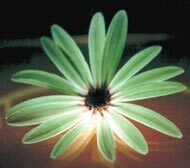 In addition, the following plants have been transformed with gfp: Medicago sp., Arabidopsis, lima beans, petunia, peas, Lisianthus, Osteospermum and African violets. The Galassia Flower organization has commercialized gfp poinsettias, gerberas, chrysanthemums, roses and orchids. Animals transformed with the gfp gene include mice, dogs, mosquitoes, fruit flies, pigs, cats, rabbits, round worms, zebra fish and angelfish among others. To learn more, check out "Green fluorescent protein" on www.wikipedia.org; the website GFP from www.conncoll.edu/; the website www.galassiaflower.com.au and the book Glowing Genes by Marc Zimmer. Images from: Nat.Geog.Soc. ; //myths-made-real.blogspot.com/; www.scientistsolution.com; www.bioc.rice.edu/; www.stretcher.org/; www.conncoll.edu; A. Mercuri et al.